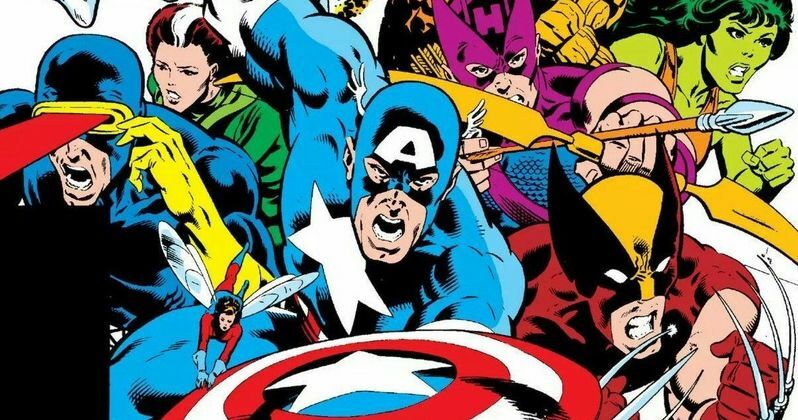 Secret Wars hasn't been officially announced by Marvel and Disney yet, but it seems inevitable that the iconic comic book story that united all characters in a 12 issue miniseries will be brought to the big screen. And when it happens, Joe and Anthony Russo may be the only ones who can get the job done. It's been speculated that Joe and Anthony Russo will be done with the MCU once Avengers 4 is in theaters. It will be their fourth Marvel movie after Captain America: The Winter Soldier, Civil War, Infinity War and Avengers 4. They have these Marvel superhero wars down pat. And Secret Wars, which has the potential to be even bigger than the two-part Infinity War arc, could entice the Russo brothers back into the fold. It's anyone's guess what the Marvel Cinematic Universe will look like after Avengers 4 hits theaters. None of Marvel Phase 4 has been officially announced with the exception of Spider-Man: Far From Home, which reportedly picks up just moments after Avengers 4 ends, though there are new unfounded murmurs that it may actually be an Infinity War prequel. If the Russos have their way, they'd like to see Secret Wars land on the upcoming roster. Secret Wars may be one of the few ways to raise the stakes when it comes to taking the MCU into the future. Joe and Anthony recently held a Q&A for Infinity War at the Arc Light Theater in Hollywood, where they refused to answer any questions about Avengers 4. Especially in terms of determining when the first trailer might drop. They did field some other interesting inquiries. And the pair were asked to confirm that Avengers 4 was their final MCU movie. The two brothers brought forth a surprising response. Some took their tone as a joke, but it's hard to say, as they proclaimed they would be staying away from Marvel studios, "until they're ready to make Secret Wars." Marvel Super Heroes Secret Wars debuted back in 1984. The simple idea behind the story was that the world's biggest superheroes would fight the world's biggest villains, but know one on earth knew about it. The idea came from Mattel, who launched a tie-in toy line of action figures and accessories. Characters included heavy hitters like Spider-Man, Wolverine, Captain America, Iron Man and the rest of the usual suspects. The title came from research that claimed 'Secret' and 'War' were two words that scored high with young boys. Marvel Comics' then-editor-in-chief Jim Shooter was responsible for constructing a story around this idea. The comic books follow an alien race who kidnap all of the Marvel heroes and villains and make them brawl for entertainment purposes. The winning side would be awarded whatever they wished. Secret Wars became one of Marvel's all-time biggest titles. But Mattel failed to find similar success with their toys, which flopped. Infinity War and Avengers 4 bring pretty much every Marvel character in the MCU to the screen together to fight in some amazing action scenes. Anything else is going to pale in comparison. Marvel could go the other way, and make more intimate superhero fare. But it seems like a no brainer that Marvel would be working to bring Secret Wars together as their next big ensemble movie. With Fox being absorbed into Disney, it would also be a great way to introduce Wolverine and the X-Men into the MCU, as the Mutants played a big role in Secret Wars. Fox's villains could also finally be utilized. There was also a 2015 Marvel comic called Secret Wars, which repurposed the main concept, though it proved to be even more epic in scope. So, will fans actually see Secret Wars brought to life on the big screen? It's entirely possible. Though only Spider-Man: Far From Home has been officially announced, it is known that Disney and Marvel are currently working on other Phase 4 movies that include Black Panther 2, Doctor Strange 2, The Eternals, and a Black Widow standalone movie. Guardians of the Galaxy Vol. 3 was also part of the lineup, but after director James Gunn was fired, it has yet to find a new director, and is sitting in purgatory while Marvel figures out what it wants to do with the sci-fi franchise, once expected to launch the next few years of the MCU as we know it. This news arrived from The Hollywood Reporter.